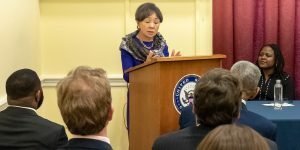 Rep. Doris Matsui (center) speaks at a Capitol Hill briefing on the 340B program in April. June 13, 2018—Newly introduced legislation would demand accountability and transparency from drug manufacturers participating in the 340B drug pricing program. The bill, sponsored by Rep. Doris Matsui (D-Calif.), is the most significant pro-340B proposal in nearly a decade. Under the Matsui bill, known as the Stretching Entity Resources for Vulnerable Communities (SERV Communities) Act, the Health Resources and Services Administration (HRSA) would be required to move forward with assessing penalties against drug companies if they “knowingly and intentionally” charge more than the allowable price to 340B hospitals, clinics, and health centers. The bill would codify in the 340B law HRSA’s longstanding policy that requires manufacturers to sell drugs to 340B providers at a penny in certain cases when they raise their prices significantly higher than the rate of inflation. Additionally, the bill would require the U.S. Department of Health and Human Services (HHS) to launch a secure website within 90 days that gives providers access to 340B prices, something Congress first directed HHS to do eight years ago but the agency has not yet implemented. Matsui’s legislation would also reverse controversial Medicare Part B payment cuts that went into effect on Jan. 1, 2018, for many 340B hospitals, which reduced what Medicare pays by nearly 30 percent taking away a total of $1.6 billion in 2018 alone. The bill would order the Centers for Medicare and Medicaid Services (CMS) to pay 340B hospitals at the same rate they pay all other hospitals. Those cuts have drawn strong opposition on Capitol Hill, where nearly 200 House members have cosponsored legislation by Rep. David McKinley (R-W.Va.) to block them. Several national hospital organizations and several hospitals and systems have taken the government to court to challenge the legality of those cuts. That suit is still pending. Require the federal government to enforce a 2010 law imposing civil monetary penalties on manufacturers that “knowingly and intentionally” overcharge 340B providers. The Trump administration recently delayed enforcement of those rules until July 1, 2019, prompting bipartisan criticism on Capitol Hill. Prohibit manufacturers from discriminating against 340B providers through the use of limited distribution networks. Increase the number of manufacturer audits so that they are proportional to DSH hospital audits. Since 2012, the Health Resources and Services Administration has audited 11 drug makers and more than 900 providers. Matsui’s bill follows the introduction in recent months of several anti-340B measures that would freeze participation in the program and impose significant reporting requirements on hospitals and other providers. Congressional committees have also held a number of hearings looking at the program and another one is scheduled for June 19.